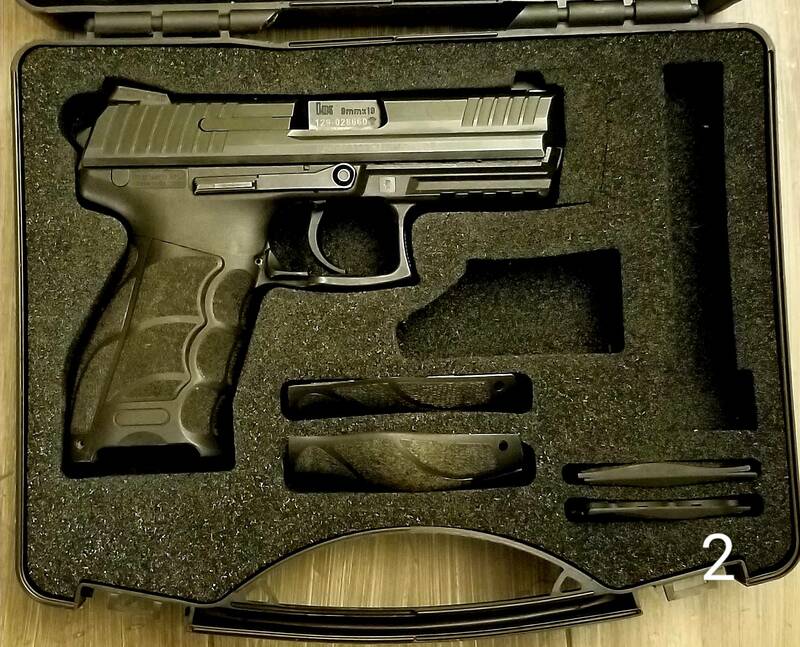 Gun 1 is a BI-dated (2018) gun purchased new last year. It started life as a v1 LEM and is now configured as a v4.1 LEM. 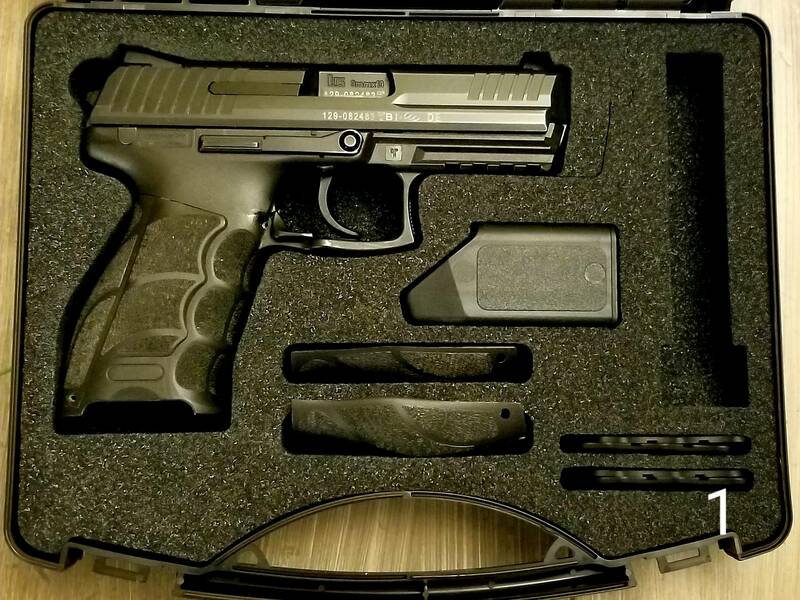 It was sent to HK in October and they installed the 4.1 LEM kit (work order included). It has Dawson Carry sights installed (.125" front/.155" rear) which have the front sight painted orange. The sights are tip-of-the-front-sight @ 25 yards with 147gr HST and 147gr Speer Lawman. It was primarily my dry fire gun. It has a round count of 832, all of which was either Federal HST, Speer Gold Dot, or Speer Lawman. I have never experienced a malfunction with this gun. The gun has holster wear around the muzzle; overall I'd rate it as cosmetically good. It includes all factory accessories and two 15-round magazines. Gun 2 is a BA-dated (2010) gun I purchased used in 2017. It started life as a v2 LEM and is now configured as a v4.1 LEM. Per the previous owner, it was sent to HK for a 4.1 LEM installation but I have no documentation of who did the work. He provided an estimate of 1,000 rounds fired, and I recall believing it upon receipt (fairly minimal wear). I estimate a round count of 4,500 rounds on the gun, of which I can document 3,500 because I put them there. Upon receipt I replaced the RSA with a new one. The gun was vetted for reliability and used as a carry gun. I have never experienced a malfunction with this gun. It has a Trijicon HD XR front sight (orange) installed, and IIRC it was dated 2017 (the paint has worn off); it also had a Wilson Combat tritium rear (2017) installed. The setup is .125" front/.165" rear and is tip-of-the-front-sight @ 25 yards with 147gr HST and 147gr Speer Lawman. Both the front and rear tritium have plenty of life left in them. This gun will also include a spare v4.1 trigger return spring. The gun has holster wear around the muzzle and some along the sides of the slide; I'd rate it as cosmetically fair because of this. It includes all factory accessories and two 15-round magazines. I'm asking $500 to your FFL. Last edited by ssb; 02-14-2019 at 05:59 PM.